Before pursuing the question of what it means to design contextually, we need to make sure we are on the same page about the term context. The dictionary shows it to mean “the circumstances, background or setting where a particular act or event occurs.” As far as architecture is concerned, the context is usually thought of as the site or neighborhood and the particular event is the building itself. To really get the best sense of what this means, close your eyes and think of a particular place, say the neighborhood where you live. A film strip of images likely unfolds in your mind, detailing the sights, sounds and smells you associate with that place. By contrast, when describing a place as being without context, we mean that a particular site is lacking clearly visible and definable character. But is that all there is to context? 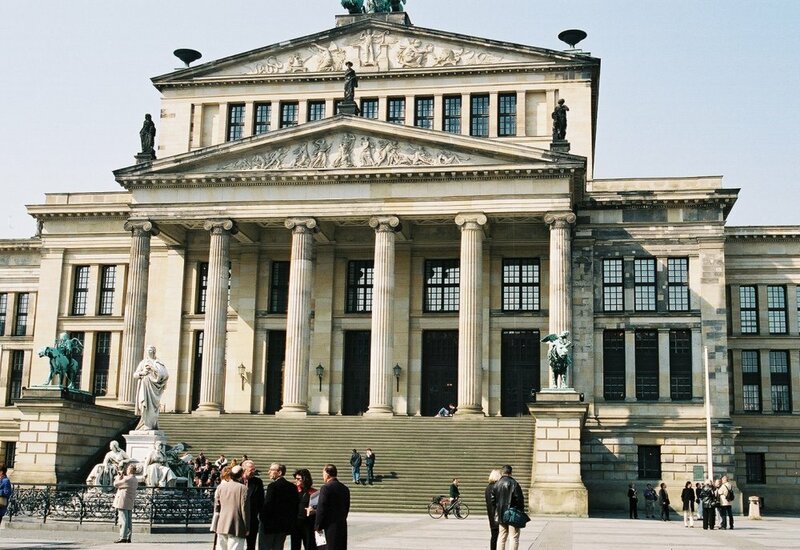 During the initial discovery phase of design for Schermerhorn Symphony Center, DMSAS Principals and key project stake holders traveled to some of Europe’s most remarkable concert halls. While geographically disparate from Europe, Nashville’s aspirations to be ‘the Athens of the South’ made these precedents contextually relevant studies. Think again about your neighborhood and some other attributes likely enter into your film strip. Do you not also see memories, events (historical and otherwise) and even particular people? And, if you’ve lived in a place long enough, maybe you’ve taken this a step further in your mind by incorporating something aspirational, like an idea of what that place or context should or could be. When seeking design inspiration, we often find ourselves facing this interesting conundrum: how can the design address the physical attributes of a context – the prevalent building types, commonly-found palates of materials and oft-occurring architectural styles – as well as the ephemeral attributes of context, history and lore of the city or region and the goals and aspirations of the particular community. A small portion of context and iconography images gathered during early phases of design for the Fort Worth Arena, which will be primarily used to host the annual Stock Show & Rodeo. We are often asked to strike a delicate balance in our designs to improve the site while doing so in a way that fits within the already established context. Understanding context means more than delving into architectural guidebooks or looking at surveys and photographs of a site. It means that we have to go beyond the immediate boundaries of a building plot and look at the larger influences of a neighborhood, a city or even the region in which a project is located. And when all of that study doesn’t reveal a particular feel or vibe, it likely means we haven’t dug deep enough. We need to look farther and wider to discover the context. This further study often requires talking to people in the community, looking into the history and tradition of the particular building type we find ourselves designing, studying users’ behavior and asking users about their motivations, desires and expectations. Above all, determining context requires a level of deference and curiosity. 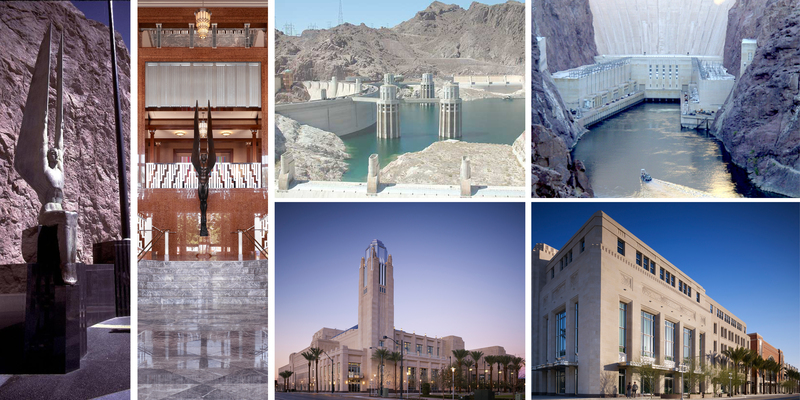 With no architectural style indigenous to Las Vegas, a city notorious for constant renovation and momentary-monuments, the firm drew inspiration for The Smith Center for the Performing Arts from the area’s greatest enduring structural achievement, the Hoover Dam. One of the firm’s earliest projects, 1818 N Street demanded both contextual and historic sensitivity. 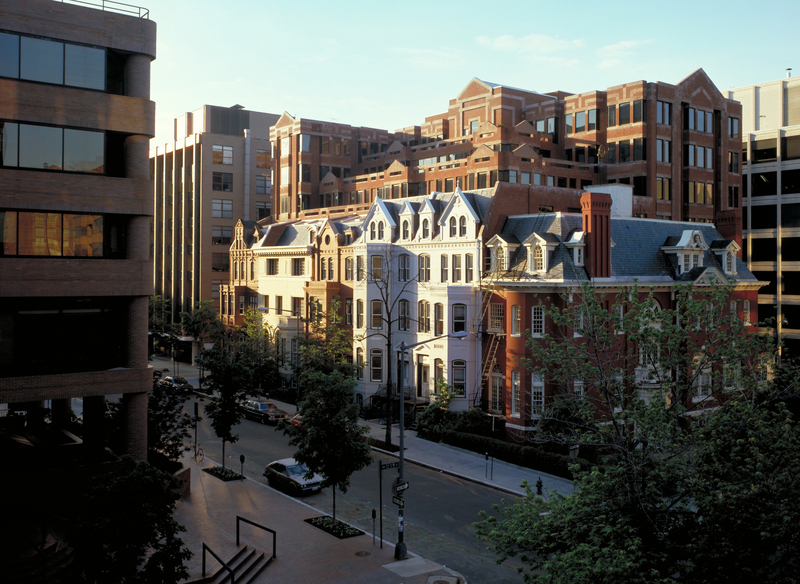 Transitional stepped massing was used to preserve the feel and scale of the historic townhouses while appropriately blending them with the surrounding office buildings. Fast-forward to today and a current project I do know quite a bit about: the Gaillard Center in Charleston, South Carolina. You might readily ask, what is it about the context of Charleston that could present a problem? It is, indeed, a perfectly lovely historic city, comprised of many elegant, older single-family, detached houses set amid gracious gardens and woven together by beautiful tree-lined streets. It is, seemingly, a well-defined context. The problem is that our project, technically a renovation and expansion of an existing 1960’s-era municipal auditorium, is a huge building (over 260,000 SF) and larger than anything Charleston has seen constructed in some time. The original Gaillard Center featured a monotonous facade lacking articulation and detailing. The Gaillard, both in its original and expanded forms, is an enormous intrusion into the City fabric. The original structure was very much a product of its time – an act of urban renewal (several historic homes were torn down and parts of Charleston’s quirky street grid were changed to accommodate it) expressed as a modernist edifice intended to look ahead rather than to the City’s past. While the old Gaillard grew outdated, both aesthetically and functionally, the community’s views of itself and goals for its future evolved; with the new Gaillard the community now chooses to celebrate its past, instead of ignore it. Faced with expanding an already-too-large building, we found an opportunity to fashion the additions using discrete and articulate massing that breaks the bulk of the building down into pavilions, hyphens, towers and bays. The massing is then complemented with a layer of detail and ornament that is friendly, meaningful, scale-giving and inspired by the historic forms of Charleston’s most beloved buildings. 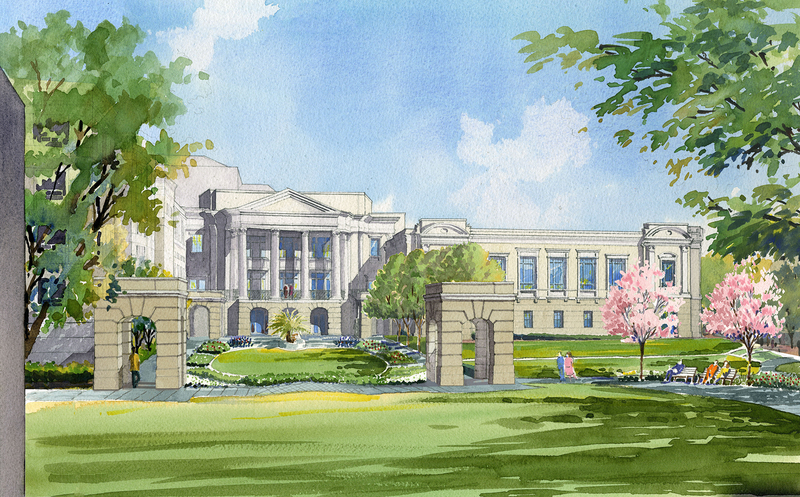 No, all of these things won’t make the new Gaillard Center disappear, but they will help this new building to fit within the community and the context of the City of Charleston. What to do when that larger context either doesn’t exist or isn’t well-defined? Look harder. And, when you look harder and the aspirations and ephemeral context appear to be different from the physical context that is there, you may just have to build it yourself. Designing with this particular attitude towards context does not mean we will arrive at one universally perfect solution every time if we follow this formula. We will, however, most likely be assured of arriving at a building that will be relevant to, embraced and even loved by, the greatest number of people who will see it, visit it or touch it on any given day. This result, to me, is a major benchmark of success for our projects. Remaining relevant to the communities where I work is very important to me and what keeps me interested and engaged on any given day. The preceding was authored by DMSAS Associate Steve Knight. Mr. Knight joined the firm in 1997 and has worked on many of the firm’s performing arts venues, including the Gaillard Center, Schermerhorn Symphony Center, The Palladium at the Center for the Performing Arts and The Smith Center for the Performing Arts.